It's time to award those starred jerseys and skinsuits for the 23rd Edition of the European Championships. This time the host city Herning in Denmark - home to GP Herning and of course host city for the grande partenza for the Giro d'Italia 2012. When the 2017 European Road Cycling Championships kicks off in Herning, Denmark on August 2nd – 6th we can guarantee an experience out of the ordinary. We look forward to giving you and your family the best summer experience of the year. For five whole days you can enjoy the buzz of a gigantic international cycling event up close and meet the very best European road cycling riders. Almost 800 riders, from more than 45 European nations, will participate in the 2017 European Road Cycling Championships in Herning. In 2016, 777 riders participated. You will get to see the very best riders from countries such as Germany, Norway, Belgium, Slovakia, France, Netherlands, Italy, Spain and, of course, Denmark. Both men and women will give their all to win one of the 12 sets of medals in the disciplines of time trial and road racing. Riders from the classes; Junior, U23 and Elite will be in attendance. The European Road Cycling Championships has been held every year since 1995, however, the Championships in its current set up has only been held once before, in Plumelec, France in 2016. In 2016 the elite men and women joined the Championships for the first time since its beginning. 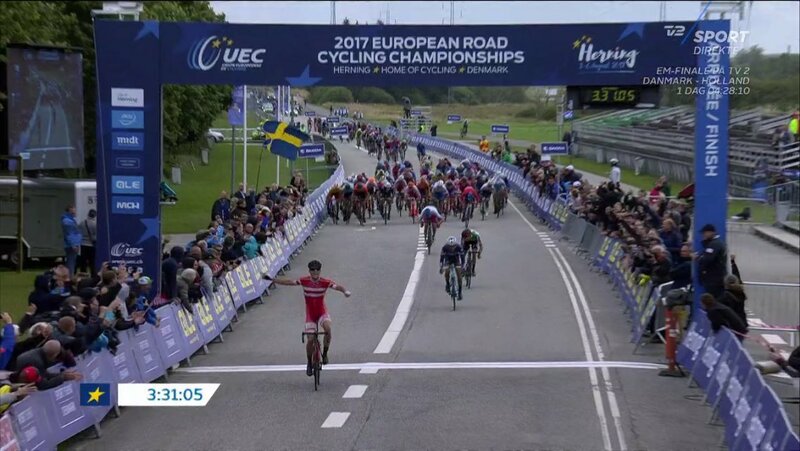 The 2017 European Road Cycling Championships, EuroRoad17, is a collaboration between the European Cycling Association (UEC), the Danish Cycling Union (DCU), Sport Event Denmark, Herning Municipality and MCH. When the Championships were moved from Nice to Plumelec last year they had a ready made course for the road races. Herning of course plays host to GP Herning, famed for it's grusvej - the gravel roads found in the area. There are no gravel roads in the Euro championship courses (Booooo), instead the organisers have provided flat and FAAAAASSSSSTTTTT in the hopes of attracting the marquee sprinters. The 2017 European Road Cycling Championships will consist of four different courses. The classes; Junior, U23 and Elite will ride different courses and distances. There will be three different time trial courses: 18,2 km – 31,5 km – 46 km. The courses are planned so spectators at the start and finish can see each of the riders pass three times. 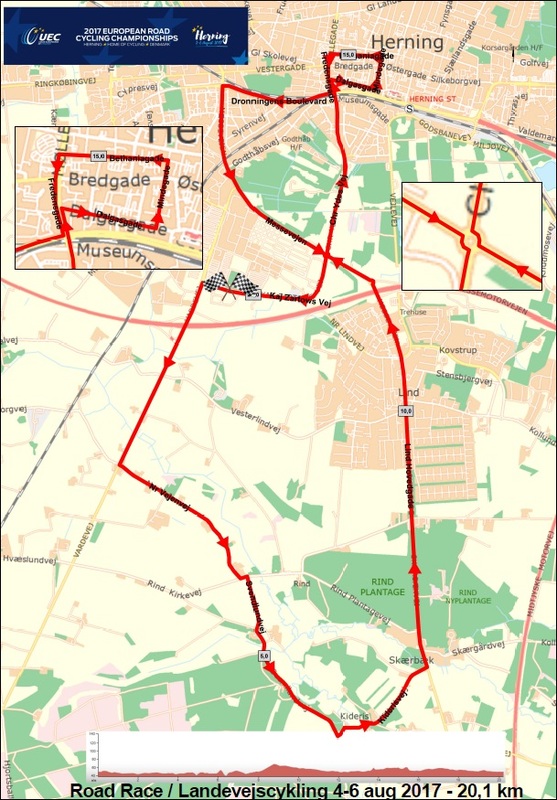 The road race will be held on a 20 kilometer circular route. The many riders will pass through the city center several times. The elite women will pass 6 times while the elite men will pass a whopping 12 times. As expected the course is a quick, flat route, which gives hope that the greatest European sprinters, including the defending champion, Peter Sagan, will be in attendance. I don't know what the route for 2012 Giro prologue but it was won by Taylor Phinney. I'm expecting the same style of course here. All categories use the same 20km circuit. The website gives all these routes as as downloadable pdf files. The current start list for the championship is here... as the event ones become available I'll try and pop them in the table above. I'm sure we'll get around to discussing favourites for TTs and Races once they actually start. Can we watch it? YES we can! Eurosport Player has all the TTs and Races from Weds through Saturday, with the elite men being shown pan European on ES2. Italy with a one-two and first medal on the board for the home nation. I watched on the Eurosport Player, on one of the extra channels. No comms, feed was fine and there were some timings on the screen. this would have been OK but unfortunately the live timings that should have been on the website were not working. I hope they can sort it for the rest of the TTs. And then Pernille Mathiesen stepped up! Another 1-2 in the Men's U23 ITT! Pernille Mathiesen solos in to take the double! The top 4 pulled away in the last 20km and worked really well to maintain the gap. Rikanov took some monster pulls in the finale which prob cosst him a podium.With the peloton breathing down their necks under the flamme rouge, Pedersen went long, opened the sprint with 300m to go and held it home. I like that podium and would wish for a joint third place so that they all could share in it. Lot of crashes in the race including just before, and just after the finish. For the most part the weather has been dry, but I think the rain is not too far away. So, presumably it's Dideriksen to win this afternoon. Bikey is already FIVE DOG YEARS OLD. It's his/her birthday today. Happy birthday I guess, hope your aging process slows down. You know how it goes by now and in fact I meant to write something before the race and name Casper Pedersen as the one to watch based on the number of results since early spring in similar races. Not a sprinter at all but strong and deadly fast in small groups and he crushed the others in the break for sure. 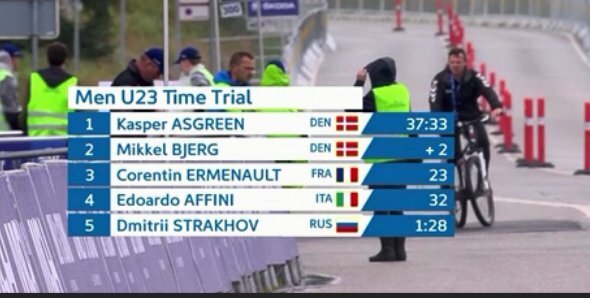 Pedersen, third year u23, according to live text coverage was in all moves in the last 50 km also characterized by many crashes. I believe the Dutch may have something to say about that. Be interesting to see how it's raced. Small late break, mass bunch sprint, and they're saying the wind has got up ...could we see echelons? Who are that team all over the front of the peloton? It's a bit soul less watching without commentary. I'll watch Sporza when it starts in a bit. Coverage has moved to Een from Canvas. Unfortunate crash in the break and some er tactics that you don't normally see when a group like that comes to the finish in a men's race. A vaguely familiar name takes the title. Well, that turned out to be great race to watch once it got going. Brave break of three went early (included the sole Icelandic rider Anton Elfarsson ) and quickly built a lead of more than 12 mins. Italy Norway and Denmark finally decided enough was enough and worked steadily to bring it back. I lost count of the Belgian attacks they really came to race! There was a huge number of punctures again and I read a tweet saying it's due to type of stone chippings in the road surfaces, no idea if that's true. The circuit course was exposed to crosswinds on one part, and at one point Eddy BH and Elia Viviani were caught the wrong side of the split. Denmark and Belgium drove and the whole Italian team dropped back to rescue Viviani and bring it back- after a long chase. Belgians had pretty much been attacking all day and so far Denmark had countered the moves quite well. On the last lap the speed went up and things went a little more crazy. There had been murmurs of a secret plan this morning, one that would keep all parties happy, and pretty soon we saw it in action. EBH got away with Keukeleire and Trusov and opened a huge gap as the tailwind came into play. Piling into the finale EBH went solo and I really thought he'd go all the way. The spirnt teams couldn't get that organised it was all chaotic and he was only brought back with 500m to go. It was a messy messy sprint into a fierce headwind. A couple of crashes in the last metres caused some splits, but the main guys were away. Kristoff just edged out (by a gnat's breath) Viviani who was trying to come up between big Alex and the barriers - accompanied by mucho hand gesturing. Moreno Hofland got up for third. 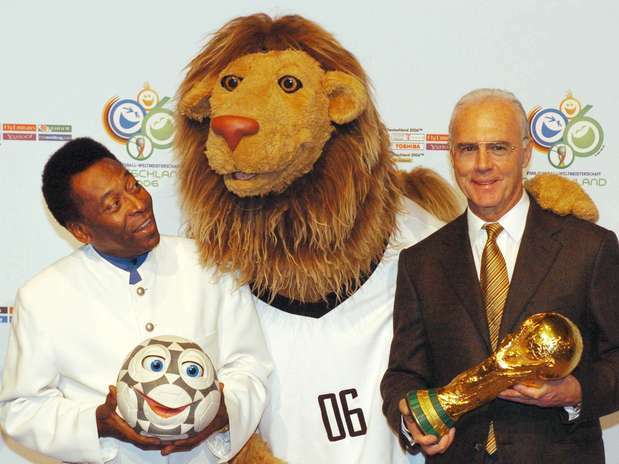 The result wasn't finalised for a while and there was some talk that the Italian squad might lodge a protest. I don't think they did in the end. To me it looked like Kristoff had held his line, he may have drifted a little right but not so bad compared to many sprints, if anything the barriers were a little 'wavy' in the closing stages. The plan was to ride for Magnus Cort and back his sprint. They carried this out all day. Setting the pace, chasing the breaks, neutralising the attack, getting the right riders to the front for the finale... until the final lap. Then, just as they needed to set for the sprint Mørkøv, Breschel and Cort lost each other - lack of experience working together. The late crashes may have played a part, but Cort was already out of position before then. They're disappointed after such good work, but that's the way the racing goes sometimes. Have to say my heart jumped when I saw #SpecialBreschel slam into the barriers ). And that's just about it for the Euro's at Herning. I enjoyed the racing, and not just because the home team did well. Thanks for the race report, Midge! I didn't see any of the races, but 9 medals for - that's more than I'd hoped for. According to the Danish journos I follow, the crowds weren't all that big, partly due to the start/finish being in the outskirts of Herning, with only locals being able to find their way around the road blocks etc. "First rider signing in USA Anton Elfarsson of Iceland. The country's first participation in the #EuroRoad17 ever"
Read that again. "First participation in #EuroRoad17 ever" - but not only for Iceland. For every country! And also their last #EuroRoad17 participation ever - the next Euros will be #EuroRoad18. Sorry, but I'm pedantic when it comes to things like that.